On August 19, “Energy and Environment Course” was held by the Japan Atomic Energy Relations Organization in the seminar room of the Institute for people associated with school education. It was followed by a tour of the facilities of the Institute with focus on analyses using radial rays that are employed in the restoration of cultural properties. The participants visited the Radiography Lab on the basement floor, the Analytical Science Section and Restoration Studio of the Center for Conservation Science and Restoration Techniques, and the exhibit of materials displayed on the first floor. People in charge of each facility provided explanations and answered questions. Shirono Seiji, the Institute's photographer, (left) explained the special roentgenography to Mr. Choi Tae Yong, Director General for Planning and Coordination (center) and Mr. Cho Hyun-Jung, Information Management Office (right), both of the Cultural Heritage Administration, Korea. On August 22, Mr. Choi Tae Yong, Director General for Planning and Coordination and Mr. Cho Hyun-Jung, officer of the Information Management Office, both of the Cultural Heritage Administration, Korea, and Mr. Choi Byoung Mi of the Korean Cultural Center at the Korean Embassy in Japan visited the Department of Research Programming. The purpose of their visit was to investigate cases overseas on matters of the management of cultural heritage archives and digitization of cultural properties and to hold discussions with persons in charge of such matters. 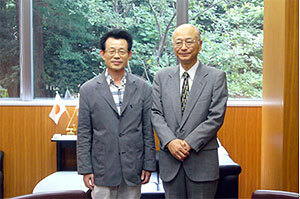 After talking with the Institute’s Director General Suzuki, they visited the Library of the Department of Research Programming and observed the data input work. They also visited the Image Laboratory where Shirono Seiji, the Institute’s photographer, explained the newest special roentgenography showing the differences in fluorographic images of silk made in Japan, Korea and China. The visitors listened with great interest to the results of studies using high technology and exchanged opinions. The Republic of Korea is now promoting the construction of cultural heritage archives and the digitization of data on a national basis, and the information provided by the Institute seemed to be of great use to them. ”Peacocks and Pine Tree” in the collection of the Art Gallery of Greater Victoria, Canada, which is being restored this year, is a large folding screen believed to have been made in the first half of the 17th century. There are numerous damages on the folding screen and materials considered inappropriate for the restoration of traditional works of art, such as synthetic coloring materials, adhesives and western paper had been used for reinforcement in the past. 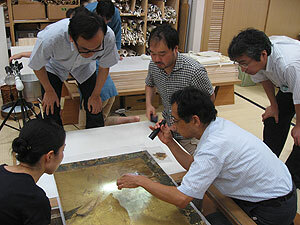 To return the screen to a good condition as much as possible, a discussion of the details of the restoration plan was held at Bokunindo (Shizuoka city), the restoration studio, on August 4 (Mon) by the persons in charge there and four from the Institute – Kawanobe Wataru, Deputy Director of the Center for Conservation and Restoration Techniques; Kato Masato, researcher of the Technical Standard Section of the Center; Tanaka Atsushi, Director of the Department of Research Programming; and Emura Tomoko, researcher of the Department. Restoration of the folding screen is scheduled to be completed by the end of this fiscal year. On August 20 and 21, the 23rd International Costume Congress was held at the Hida Earth Wisdom Center (Takayama city). Approximately 200 researchers, textile-dyeing artists and designers from Korea, Taiwan and Mongolia as well as Japan participated. 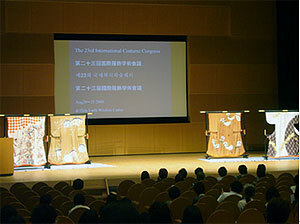 Kikuchi Riyo of the Department of Intangible Cultural Heritage attended the Congress and presented a research paper. The common theme of this academic meeting was “East/West Exchanges in Costume Culture.” Lectures, presentations of research papers, poster sessions and an exhibition of creative costumes were held. Participants from various countries had the opportunity to learn about studies on textile-dyeing techniques and deepened their awareness of national differences in ideas related to the conservation of techniques and attempts at reproduction. On this occasion, a visit was also made to the Mino-Washi Museum (Mino city) and Shunkei Kaikan (Takayama city) to collect information on traditional craft techniques. Since the Department of Intangible Cultural Heritage has just begun to collect information on traditional craft techniques, it will continue to expand its activities to different regions and fields of craft techniques. The Center for Conservation Science and Restoration Techniques conducted an on-site investigation of Iwami Ginzan Silver Mine Site, which has been inscribed as a World Heritage Site, from August 11 (Tue) to 13 (Sun). The enormous number of visitors there, which is due to the fact that the site has been added to the World Heritage List and that it was the summer vacation season, reinforced the impact recognition as a World Heritage Site has on people. A visit to the Iwami Ginzan starts from the old Omori magistrate’s office, which is now a reference library, through an area of preserved townscape designated Preservation District for Groups of Historic Structures, past the Kumagai family residence and the former Kawashima family residence, designated as important cultural properties, and to the entrance of the mineshaft. 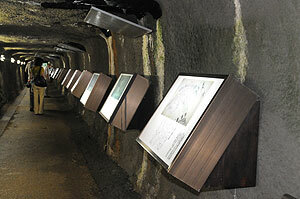 A plan is now being made to enable visitors to view some of the mineshafts, including some big ones which people used to enter in on horsebacks. As a World Heritage Site, Iwami Ginzan is expected to continue to remind people of bygone days. Conservation methodology and techniques are transferred in order to foster local experts. A portable X-ray fluorescence analyzer is used to analyze the elements contained in the paint layers of a mural painting. Since the number of experts on conservation is insufficient in Tajikistan, these mural fragments are placed in the storage of the National Museum without being appropriately treated. 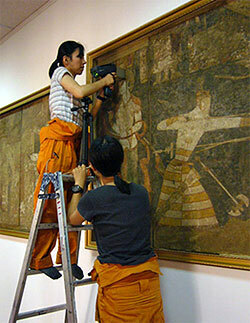 Therefore, there are numerous problems and the fragments need to be treated for conservation and future exhibition. In this project, the conservation knowledge and techniques that the Center has accumulated will be transferred to Tajikistan in order to foster Tajikistan experts on conservation. One of the major issues associated with the mural paintings is the use of synthetic resin that had been impregnated into the fragments during their detachment. This synthetic resin was used to protect the mural fragments at that time but has yellowed and hardened the soil that had adhered to the surface, making it difficult to see the mural paintings now. Activities of this mission included a cleaning test to remove the discolored synthetic resin and hardened soil from the mural fragments. Investigation of the paint materials is also important in understanding the painting techniques and the route by which materials used for the mural paintings were procured at the time. Thus, a portable X-ray fluorescence analyzer was used for elementary analysis, and some of the pigments were identified. As a result it was revealed that the currently black areas were once green and that various shades of red paints were used to produce different colors.